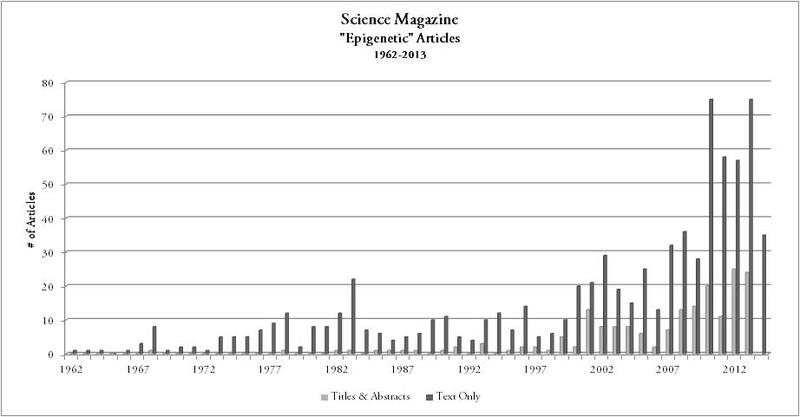 In a previous post I looked at the publication rates of articles on epigenetics in Science magazine. I picked Science as a measure of the exposure of the science-informed public to epigenetics. The take-home point from that post is that attention to epigenetics by this segment of the population is increasing at an increasing rate. However, there are other sources to consider as well in gauging the attention to and acceptance of epigenetics. In terms of assessing the spread of epigenetics within the scientific, medical and academic literatures, I searched two major databases: PubMed and Academic Search Complete. As can be seen, for the first thirty of the last fifty years the presence of articles referring to epigenetics was practically nonexistent in this literature. 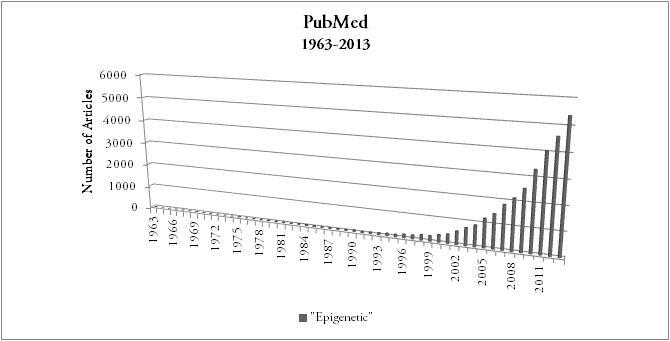 Through the mid-1990s and into the 2000s the number of epigenetics-based articles began to grow gradually and then precipitously, exceeding 1,000 for the first time in 2005, then doubling by 2008, doubling again by 2010 and then topping over 5,000 by 2013. This is by any measure a significant increase, especially in the rate at which it has occurred. While PubMed focuses on the medical and life sciences, the Academic Search Complete database is “the World’s Most Comprehensive, Scholarly Full-Text Database for Multidisciplinary Research.” Thus, the number of epigenetics-based publications returned from a search of this database is indicative of the broader level of attention of the topic of epigenetics in academia, likely including most of the articles from the PubMed search. The rate of publication of epigenetics articles in academics more generally mirrors that for epigenetics articles in the life sciences in particular. Again, by any measure these are significant increases in the rate of publication, indicative of a commensurate increase in the attention being devoted to epigenetics. An interesting comparison, though, is comparing the rates of publication in scientific and academic journals with publication rates in other more popular-focused sources: The increasing rate of publication of epigenetics articles in Science magazine is similar to the exponential rates of publications in PubMed and the ASC databases, though not as dramatic or extreme. This difference in publication rates suggests that the high level of interest in epigenetics in academia is just now crossing over into the awareness of the informed public. An additional and even more revealing point of comparison is with the rate of publication of epigenetics articles in the mass media. The source for this comparison will be the New York Times (NYT). While the NYT not as good an indicator of the general public perception of an issue as a national survey, it is at least an excellent source for tracking how an issue is framed by and for elites, and how an issue is presented to the general public. Also, the NYT is the number two newspaper in the United States in terms of weekday circulation and is also one of only three newspapers with a national instead of a local or regional readership, therefore it is a reasonable proxy measure for public attention at the national level. 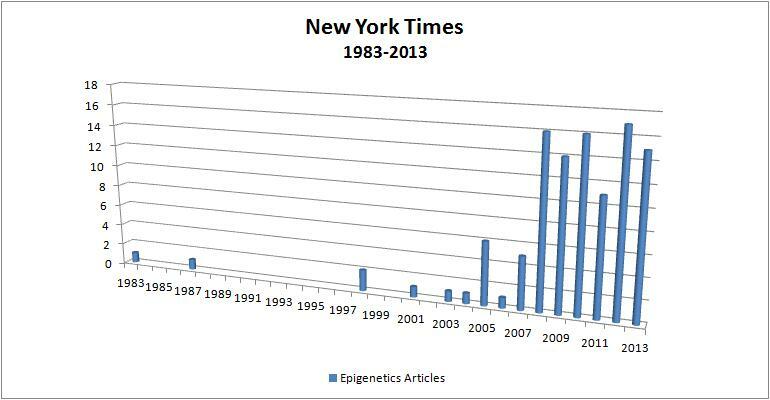 Contrary to the academic and scientific sources, there was no mention of epigenetics in the NYT, before 1983. 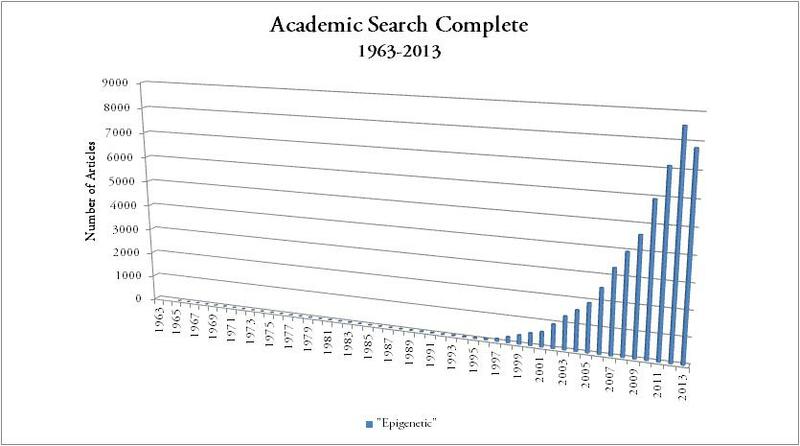 Still, per the pattern established by searches in these other sources, epigenetics received practically no mainstream public attention until the 1990s, and then suddenly took off in the 2000s. One major difference is that while there is a significant increase in the late 2000s, there is not the precipitous climb to a peak; another major difference is in the magnitude of the numbers of articles – instead of thousands or even hundreds of articles, the number of articles on epigenetics per year in the NYT has just barely hit double digits. Thus, while there is evidence of an increasing awareness of epigenetics by the general public, it is nowhere near the level of attention given to epigenetics in the sciences and academia. There is an extensive literature on the lag between scientific research, public awareness, and the eventual incorporation of that research into policy. This literature suggests that given the vector of attention given to epigenetics in the sciences and academia, the pressure will build and eventually at some point epigenetics will spillover into public awareness and become a significant factor in policy discussions. How long this will take is difficult to predict, as is to what use the causal narratives of epigenetics will be utilized. The analysis of these emerging narratives of epigenetics is the core of my dissertation, and will be a significant focus of this blog. For now, though, the main question is how long will it take for the significant attention given to epigenetics in the sciences and academia to spillover into the popular awareness? What do you think it will take for epigenetics to become general knowledge? Is such a thing even possible? Guthrie, S., Pollitt, A., Hanney, S., & Grant, J. (2014). “Investigating time lags and attribution in the translation of cancer research: A case study approach.” Retrieved June 27, 2014, from http://www.rand.org/pubs/research_reports/RR627.html; Bradshaw, G. A. and J. G. Borchers. (2000) “Uncertainty as information: narrowing the science-policy gap.” Conservation Ecology 4(1): 7. [online] URL: http://www.consecol.org/vol4/iss1/art7/; Abbasi, D. R. (2006). Americans and climate change: closing the gap between science and education : a synthesis of insights and recommendations from the 2005 Yale F & ES Conference on Climate Change. New Haven, CT: Yale School of Forestry & Environmental Studies; Leshner, A. I. (1997). Addiction is a brain disease, and it matters. Science,278(5335), 45-47; Wynne, B. (1992). Misunderstood misunderstanding: Social identities and public uptake of science. Public understanding of science, 1(3), 281-304; Locke, S. (1999). Golem science and the public understanding of science: from deficit to dilemma. Public Understanding of Science, 8(2), 75-92; Yearley, S. (1999). Computer Models and the Public’s Understanding of Science: A Case-Study Analysis. Social Studies of Science 29(6), 845-866; Locke, S. (2002). The public understanding of science—A rhetorical invention. Science, Technology & Human Values 27(1), 87-111. ‹ PreviousThe EPA and Epigenetics: Baby Steps or Going Nowhere? Next ›Epigenetics Before Epigenetics was Cool?